So you have a blog that is doing well and you’re now considering monetizing it? Then maybe its time to create a press kit for your blog as this is the first thing potential advertisers or PR agencies will ask for. Why? Because a media kit will help them to determine whether your blog and their brand is a good fit. 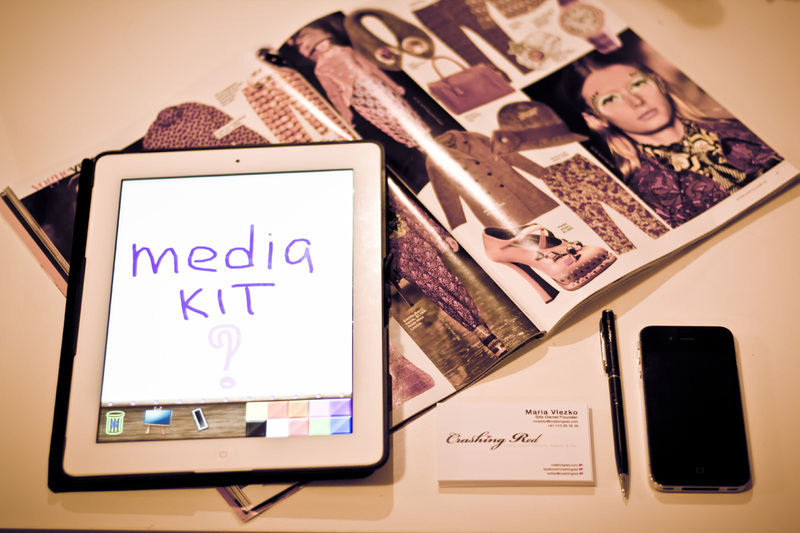 What is a press kit (or media kit)? “A press kit, often referred to as a media kit in business environments, is a pre-packaged set of promotional materials of a person or company distributed to members of the media for promotional use” Wikipedia. If you already have a media kit for your blog then you may wish to check if it aligns with the industry standards. For example in my own case, after listening to a presentation by Lady Melbourne, I found that a few things required changes in CrashingRED‘s press kit. So I decided to create a round up on how to write a media kit that will work using what I learned years ago while working as a marketing manager and more recently at Blogopolis. How the kit is assembled and what it contains depends on what purpose it is intended to serve. For example, a media kit for an established mega blog may contain only basic background information, while for a smaller blog you may wish to put more effort into presenting your blog in more detail. The list is a guide. Choose the sections below that pertain to your blog and leave the others out. It’s best to be concise and succinct. Make this section as attractive as possible! This is the first page your potential advertiser will look at and they will have to like it immediately. Let’s put it this way, if it fails this initial step, your media kit will go into the bin. So talk yourself up but keep it real and short. Do you know everything about shopping in Perth? Are you obsessed with shoes? Do you know everything about skincare? Say it! Identify your expertise and write it up right there and backup your statement with facts on the following pages (your credentials, traffic and readership). Tip: keep your introduction under 100 words. No one has time to read our poems (unfortunately). Also, as awkward as it seems, write about yourself in the third person. What is your blog’s specialty? What do you write about? For example, fashion news, personal style posts or makeup tutorials. Do you have a newsletter? Tip: Include 2-5 short lines that align with your blog’s main categories. Who are your readers? Get these stats for your blog from Alexa or conduct a blog survey. Tip: State only the most important facts, i.e. gender, age, income, whether any of your readers were influenced to make the purchase. Do you write for an online magazine or contribute to another blog? Did you make it to the “Top 20 bloggers by Jenny Jopkins”? Put it all there. Again, in dot point and preferably with some images from the press features. Even if a fellow blogger featured you, include it! A Google Analytics monthly snapshot (i.e. print screen) and Alexa ranking will suffice. Do not go into excessive detail, all they want to know is how many unique visitors and pageviews your site receives every month. Mention a few major names and include their logos. If you haven’t collaborated with any brands yet, that’s absolutely fine! Don’t worry about this section, no one will ever notice if its not there. What social media accounts do you have and how many followers for each of them? Tip: If you have 10 followers on your newly created YouTube channel, at this stage don’t include it. Focus on your largest channels. How can an advertiser reach you? Include what you are comfortable with: email, telephone, PO box details, Facebook page, etc. – it demonstrates clearly that you don’t work for free and that will eliminate those who may think you do. Tip: you may wish to create two media kits – with and without rates as personally I found your rates may make some of PR agencies a bit anxious. One or two of your very best posts demonstrating your writing style and photography, include URL to the post as well. If you have one, make sure you include it in your media kit as this is your evidence that you can do your job and do it well. Your future clients want to know what your past clients think about you, they want some kind of evidence they can trust you. Tip: Always ask your all clients for a testimonial. Include 2 or 3 of the most impressive features about your blog in online media and/or print if you have any. As Lady Melbourne suggests, “never send your media kit without your terms and conditions! You’re leaving yourself wide open to potential problems such as misunderstanding over copyrights, imagery, non payment, etc.” You can write your own T&Cs (based on examples you can find by googling it) or you may wish to employ an intellectual property lawyer to do it for you. Just to make sure there are no loopholes that someone can use against you. Business is business and the more money gets involved the higher the risks. So protect yourself now to avoid any potential problems in the future. Hope you found this post useful, lovelies! P.S. If you haven’t yet you may wish to check more tips on blogging here. P.S.P.S. If you need more information about media kit for your blog, check out this FREE eBook my lovely friend Tine from Beautyholics Anonymous wrote. Great post! Thanks for putting this together, it will help me when I finally get around to creating a media kit. Great tips, I’ll remember this post in the future in case this is something I need to think about :) xoxo ? These are great tips. I’m a long way off ever monetizing my blog, but I still find it interesting to see the business side of things. This will be saved under my favorites :) Thank you for the blogging words of wisdom! Thank you so much for writing this post, indeed, it was so helpful for me. 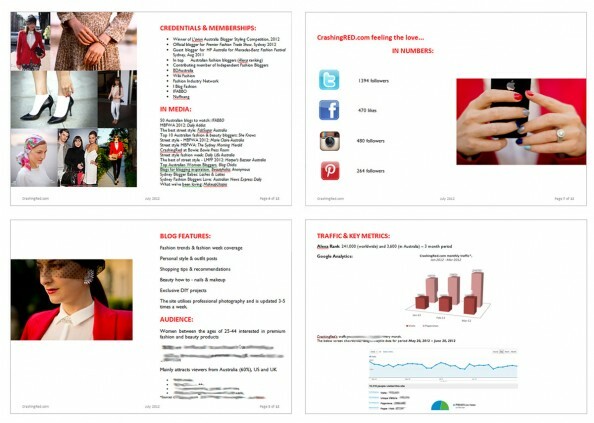 I did have a media kit, as I do PR as part of my day job but having one for fashion blog has many specialties! Thanks again, you have a lovely blog. OMG! I have been looking for a “how to” for a media kit and this one is soo easy to understand! Thank you! I will be working on mine right now! Thank you so much for these tips! I have a media kit… but it’s in dire need of a makeover will definitely be having this article up when I update it! We definitely need to update our media kit. This will be a big help. Thank you!